A friend sent me this video of remarkable table tennis shots. How do people react so quickly? The camera can’t even capture the ball moving much of the time. It’s a blur. But you do get the gist of it and have to keep closing your mouth that is gaping with astonishment. My tennis mentor, Joe Marshall (who has written over 15 articles on this site about tennis strategy), emailed that he was having trouble finding a regular tennis game after he relocated to New York from his home in Connecticut. I missed his advice and unconventional game right away. Joe is a very strong ping pong player and brings that talent into tennis, with many slices and lobs. Here is his latest report. We moved. I didn’t want to at first, but my wife insisted that life would be better if we were closer to the kids and the grand-daughter. I’ve played a few times, beating the opponents easily with my whacky game. But today I made a classic mistake. I played a guy I had beaten easily in the wind on clay. And today I took the first set on a hard court 6-1. Then I started taking it easy a little bit…..Not too different, just being a little less aggressive, and not moving in between shots……In no time he was up 2-0. I said to myself “Better buckle down”…Close game….I lost it….3-0….I got to 3-1, but he won the next two game, and he EARNED them…..tremendous play….AND movement….he was figuring me out! Down 5-1, I took the next three games. But he hit the line on every serve in the next game and had me set point……he hit me a jamming serve, which I mishit….It bounced twice on the net and dropped over…..From there I won in a tiebreak…..playing one key point where I brought him in and lobbed him FOUR times, and he STILL won the point….but I think I got to his legs on that one, and it cost him the next couple of points…..I’m glad it didn’t get to go to a third set….he seemed a lot fitter than me. Playing a lot less tennis, I have been surviving on ping pong. What a great game….The local University has a tremendous ping pong club that is open to the public…..ON a Thursday night at ten PM, it was forty college kids and 57-year-old yours truly hacking it out……I could beat most of the hackers, but some of the kids from the team are superb, playing in a style like the Olympic champs….a couple of young ladies from China were better than all but 2 or 3 of the boys. I love playing tennis with Joe Marshall, partly because he brings onto the court the spins and slices that he uses on the ping pong table. No one else at our club has his style. Here are Joe’s comments to the previous ping pong posts. I see you have Marty Reisman interviews posted. 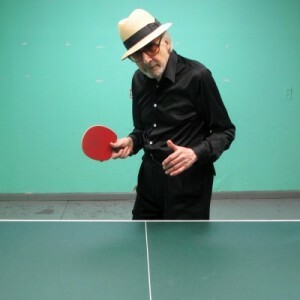 I first read about Marty way back….how he hustled people in ping pong by beating them using books or garbage pail covers…..great self promoter….and player. Back in the 70’s, when the technology allowed for great diversity in the rubber over the latex foam, a Chinese athlete rose to be #2 int he world by using two different kinds of rubber and playing defensively, sending back shots with all kinds of different spins that would handcuff the opponent. He would actually flip the racket in his hand between strokes, so you didn’t know which kind of rubber he was returning with……For this reason, it became mandatory to have the two different colors we see today on the racket (usually red and black)…so the opponent could at least have a fighting chance of reading the different spins…..some rubbers are extremely sticky, and can create a lot of spin (but are difficult to control the other player’s spin with), and other rubbers are “DEAD”, take all the spin off the ball, and just dump it back. Below are five videos (one is just a link) that show that all modern day rallies are not that short….by the way, it seems like nowadays they have switched from the 2-out-of-3, 21 point game format to the 3-out-of-5, 11 point format….at least on the ESPN shows…..I like it better this new way. The last point in this next video is something. how bout that Zhang Jike? Above is a long point in a match at a Mohegan Sun tournament. You don’t see many points like this at the highest international levels (I don’t know what level this is). What makes it interesting is that it is shown form three different perspectives. The third being an angle from above. The third angle shows how the ball leaps off the table in any of three directions due to spin. You have to be able to read that spin, allow for it in your timing of the stroke, and COUNTERACT the spin because it will leap off your paddle in a crazy direction if you don’t! This is what makes the soft paddle game so intriguing. The instructor I worked with from the USTTA said that you should try to take slam shots no higher than your shoulder….hence the jumping on the slams….for consistency and control. Mastering the neurophysiological skills of a sport is not just learning the game. It’s attuning yourself to the inner life of the sport, to the poetry in motion. A player masters the game the way a thief opens a safe: ear to the combination lock, breaking into the inner chambers through the subtleties. Players become part of a community that knows what it feels like when the shot is hit right. 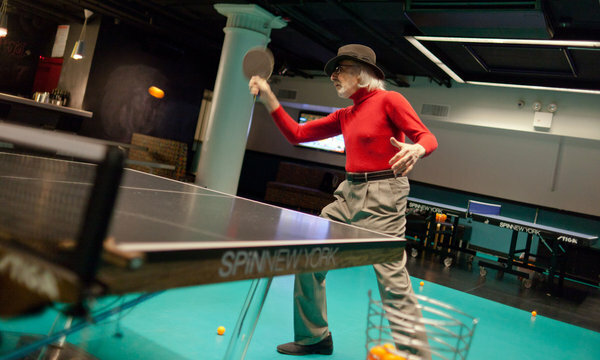 Marty Reisman is one of the last—and definitely the most colorful —of the old ping pong champions still around. 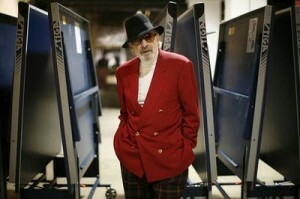 At 82, he continues to play aggressively, says he is always learning and improving, and is a helluva character. He is the only American to ever win the British Open, and you can see him doing it in the video above, when he was 19. Notice how different the rally is—using the classic hard paddle of those days—compared to modern, sponge-racket play with more spins, slams and shorter rallies. “…a legend, a 23-time international and domestic champion, author, world-class hustler, performer, unmistakable colorful character and unarguably the most charismatic player to ever step onto the court. He also played a lot of games for money and is still hustling kids when he can, according to a recent New York Times article . “With a hardbat, the player feels the shock of the ball hitting the wood, the energy transmitted directly to the hand. When a player cracks a solid slam, it is through the force of his/her swing, and nothing else. The power is unaided by any catapulting effect; all action by the player produces an equal/opposite reaction on the ball and a commensurate “whack” sound from the wood. “Although it is more difficult to apply spin in hardbat, it is easier to “read” the spin applied by the opponent. One can generally tell what spin has been placed on the ball because the opponent would have had to use a full stroke to apply the spin. By contrast, in the modern (sponge) game, spin can be applied by very slight movements, or may be affected by differences in the rubber surfaces…sometimes even two different surfaces on the same bat. Since it is easier to read the hardbat spin, it is easier to keep the ball in play and rallies are usually longer. Mystery and deception are reduced. I have heard recently that ping pong is the largest organized sport in the world, enjoyed by 300 million people. China alone has 100 million of them, and the sport is played in 200 countries. 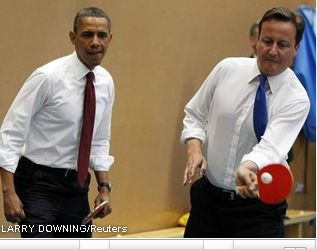 Maybe the world’s leaders should have ping pong matches instead of wars to solve sticky issues. Prime Minister David Cameron of England is in the States enjoying a state dinner tonight with President Obama. So it seems the right moment to post these two photos taken in London last year. 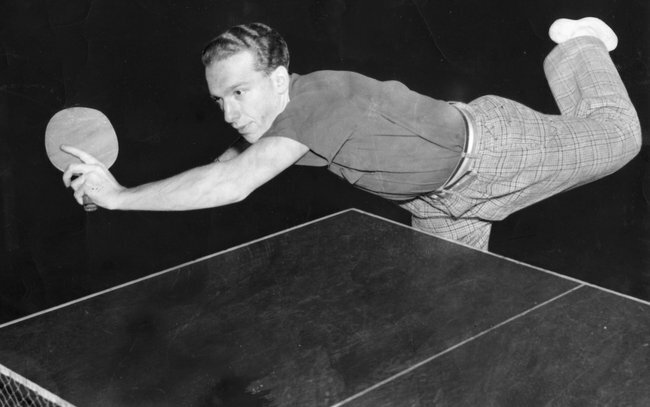 A former world ping pong champion named Sol Schiff, but known as Mr. Table Tennis, died three weeks ago at 94. He won the US men’s singles championship at 16 and then the world’s singles title in 1937, and the doubles title in 1938. Titles notwithstanding, Schiff could not earn a living playing the game. 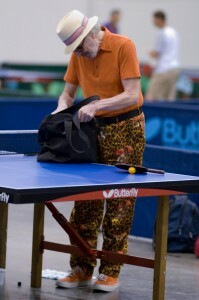 He started a business distributing table tennis equipment throughout the East Coast. 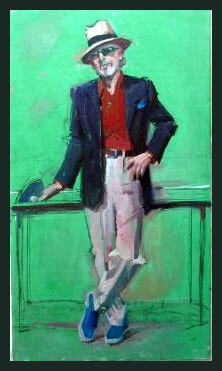 He also stayed active in promoting the sport, leading to his election as president of the USATT in 1976. 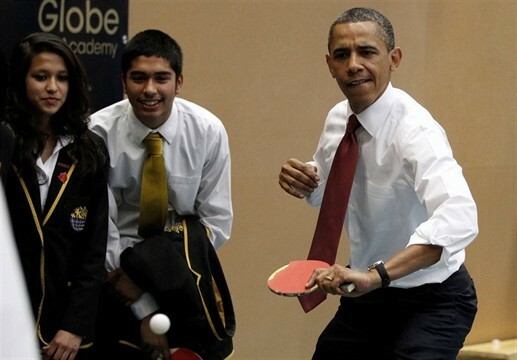 During his 10 years as president, table tennis becomes eligible to be in the Olympics. It saddens me that an athlete can be the best in the world and not earn any money from this skill. Am I getting too commercial and crude? I remember Bobby Riggs had the same complaint in tennis that there was no money in it, when he was young, and now champions make millions routinely. I wonder if this is still true for ping pong. It still is for squash. No TV rights to sell, no bucks to the best. 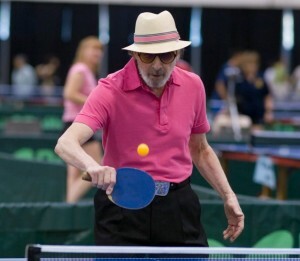 Champion ping pong player Marty Reisman has style that should not be missed…he always wears a hat, even when competing…and he has also won 23 national and international titles, including being the only American to ever win the English Open. Maybe clothes help make the man a champ. Joe Marshall sent me this video above of Roger Federer imitating William Tell—both Swiss he points out. 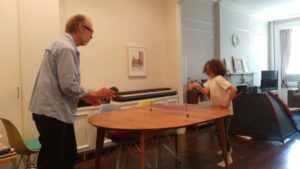 Just yesterday I saw a video with a similar trick on the ping pong table by Marty Reisman, also a champion who I will talk about shortly. When you see skill like this, it helps me understand how these top talents can place the ball so accurately. Jason Doornick sent in this video of the youngest player ever in a racket sport. Just check out the first few seconds to see what it takes to be great in sport. “How do you serve?” my son asked after a ping pong game. I have been playing on and off for maybe 60 years, and he is still an improving novice with one simple serve. I was able to show him five or six ways to put different spins on the ball at the beginning of my serve. THEN THE LIGHT BULB FINALLY WENT OFF: My buddy Joe told me he plays “junk ball” tennis based on his earlier ping pong skills. He puts all kinds of spin on his shots, rather than hit the ball powerfully each time. He also lobs a lot to drive his opponents crazy. Some guys at our club refuse to play with Joe, because his unorthodox rhythm and unpredictable, unconventional spins drive them crazy. So when I asked Joe to show me some different serves, HE SHOWED ME 27. TWENTY SEVEN!!!!!!!! I have only been using one flat serve and occasionally attempting a feeble alternate serve with some spin. But now I have all these choices to work on. And Joe also hit serves to me for half an hour, so I could learn how to lob them back over the net man. I was raring to go and try out all my new tricks. Now can you imagine how thrilled I was today to play the best tennis of my life against my toughest opponents…doing lobs and more than one serve. My team won 6-4 and 6-1, and my net game was terrific. That makes six sets we have won out of 16 played in this weekly game in which I am the weakest combatant. Can’t wait for the next challenge. You are currently browsing the archives for the ping pong category.